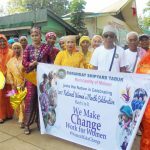 #womensmonth » Zamboanga-Basilan Integrated Development Alliance, Inc.
Over 600 women from the Municipality of Maluso in Basilan Province for the first time participated in the parade observing Women’s Month with this year’s theme “Women Make Change”. The women marchers came in their colorful cultural attires, highlighting community diversity. 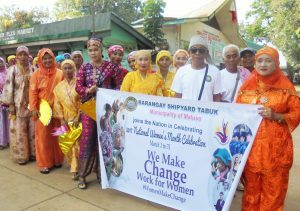 The activity, held last March 15 in Maluso, was spearheaded by then Basilan based non-government organization Nagdilaab Foundation Inc. (NFI). 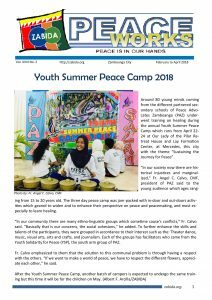 NFI together with three other NGOs based in Zamboanga City namely: Peace Advocates Zamboanga (PAZ), Katilingban sa Kalambuan Inc. (KKI), and Reach Out to Others Foundation Inc. (ROOF) are members of Zamboanga Basilan Integrated Development Alliance (ZABIDA). The event was also in partnership with the Maluso Social Welfare Development Office (MSWDO). 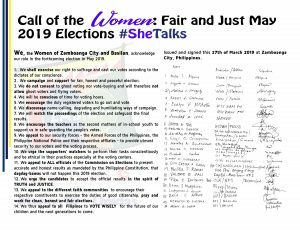 Resource Speaker Prof. Jennifer Composa, RGC and Coordinator of Gender and Development for College of Liberal Arts of Western Mindanao State University (WMSU- CLA) presented a talk on Empowering Women, Magna Carta for Women, and Violence Against Women and Children Act.